"Jaz sem dr. Ljuba Prenner, ne moški ne ženska"
The study of queer history is frequently stalled by one debate: is it fair and reasonable to label a historical figure with language that did not exist for them? Our project has long answered yes to this question, and we still do. We acknowledge that there is complexity in that task, and Ljuba Prenner, a Slovenian lawyer and author, is one of the clearest examples. There are layers of societal understanding, cultural differences, and personal experiences that all tie directly into how not only we see queer people but how queer people see themselves. The question we ask now is this: how many layers can be removed before you begin to erase a person's right to self-identify? Born in 1906, Ljuba Prenner was assigned female at birth, though there were clear indications of gender variance even from a young age. 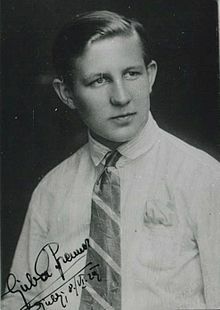 In his adulthood he became an author and a lawyer, and also entered a lifelong relationship with a woman, Štefka Vrhnjak. The first descriptor then, and that which is easiest to find evidence of, is lesbian. The next is transgender, specifically a transgender man. This is in direct conflict with "lesbian". The proof is easy to find, from his semi-autobiographical novels written from a male perspective, his masculine style, his gravitation to men's social groups, and his use of masculine language in reference to himself. A school friend later called him "my little boy" in her letters. With this evidence, it stands to reason that maybe lesbian isn't the most proper term. However, we need to continue the narrative of Prenner's life before coming to any conclusions. "I am Dr. Ljuba Prenner, not a man nor a woman"
Looking at his own words, the answer seems obvious, but there is still nuance to be recognized. Primarily, the understanding that throughout history same-gender attraction often came with the idea that you were an entirely separate gender. Pioneering European queer academics such as Magnus Hirschfeld and Karl Heinrichs Ulrichs both explored this concept, and it was not an uncommon idea in Europe while Prenner was alive. It is entirely possible that this was simply a part of Prenner's understanding of his own queerness. We are now brought back to our initial question: how many layers can be removed before you begin to erase a person's right to self-identify? He was an innovator, writing the first known Slovenian crime novel. Yet when discussing him, we're restrained by his time period in ways that he wasn’t. How does one contextualize a person who was ahead of their time? A large part of what we do requires taking a person, observing them from a contemporary lens, and translating their lives into modern language. Eventually, there comes a time when our conjecture is not needed. Though his life in many ways doesn’t fit the contemporary scope of many of the identities we've discussed, that doesn’t mean that we should disregard his own voice. Ljuba Prenner died in 1977 at the age of 71 with an understanding of himself as a lesbian who used masculine identifiers and existed outside of the binary of male and female. There is infinite complexity within this, and more than enough information that can be seen as contradicting, but complexity is not a problem to be solved. It is a reality of being human that is vital to embrace. Petrović, Jelena. Women's Authorship in Interwar Yugoslavia: The Politics of Love and Struggle. Springer, 2018. Polajnar, Gojmir. Don't Kill Anyone, I Love You. Translated by Aaron Gillies and Laird Hunt, Spuyten Duyvil, 2001. Tratnik, Suzana. Lesbian Visibility in Slovenia. European Journal of Women's Studies, 2001. Šelih, Alenka. Pozabljena polovica: portreti žensk 19. in 20. stoletja na Slovenskem (Forgetful Half: Portraits of 19th and 20th Century Women in Slovenia). Zalozba Tuma, 2007. Štulhofer, Aleksandar, and Theo Sandfort. Sexuality and Gender in Postcommunist Eastern Europe and Russia. Routledge, 2008. “Ljuba Prenner.” Prostor Slovenske Literarne Kulture (The Space of Slovenian Literary Culture), Institute for Slovenian Literature and Literary Sciences, pslk.zrc-sazu.si/sl/literarni-atlas-ljubljane/ljuba-prenner.